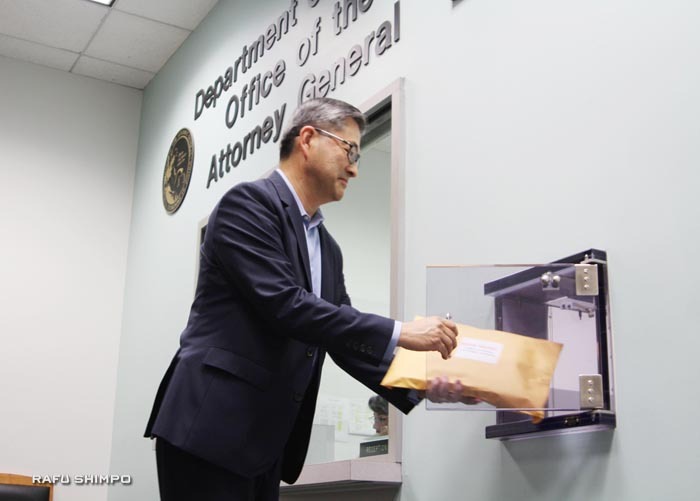 On Monday, October 19, 2015 Jon Kaji of the Ad Hoc Committee to Save Keiro hand-delivered the first batch of 2715 petition signatures to the Attorney General’s Los Angeles office, to stop the sale of Keiro. The committee is continuing to collect signatures with its goal being to collect 10,000 signatures by the end of October to present to the Attorney General. The office was to send the package via overnight delivery to Mr. Scott Chan at the Attorney General’s San Francisco office. Included with the signatures was a copy of Charles Igawa’s signed letter, along with a copy of Assembly Member David Hadley’s letter to the Attorney General. The Rafu Shimpo was on hand to capture the event and reported the article in its Japanese section of the the rafu.com website.